It is not good for the human being to be alone. 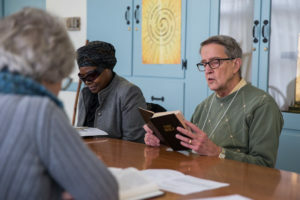 All are welcome as we listen for where the Holy Spirit leads us as we explore, wrestle and engage the lectionary texts for the upcoming Sunday on Wednesdays from Noon – 1:30 p.m. in the Edwards Room. 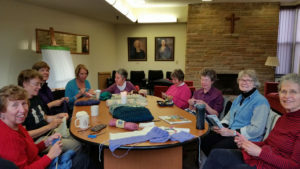 This group meets on the 2nd and 4th Tuesday of the month from 4:00 – 5:30 p.m. in the Edwards Room to knit, crochet or weave prayer shawls which are blessed by the congregation upon completion. Sitting meditation, light yoga and mindfulness practice highlight these popular offerings led by two members of the congregation, one of whom is an international trainer in Mindfulness Based Stress Reduction. Pizza and conversation frame time together with our college students as we catch up and check-in with one another.